Puerto Aventuras Recently my friend, comrade, and brother, Na Hyowoo from Korea, sent me a message asking if I knew Denis Murphy had passed away. 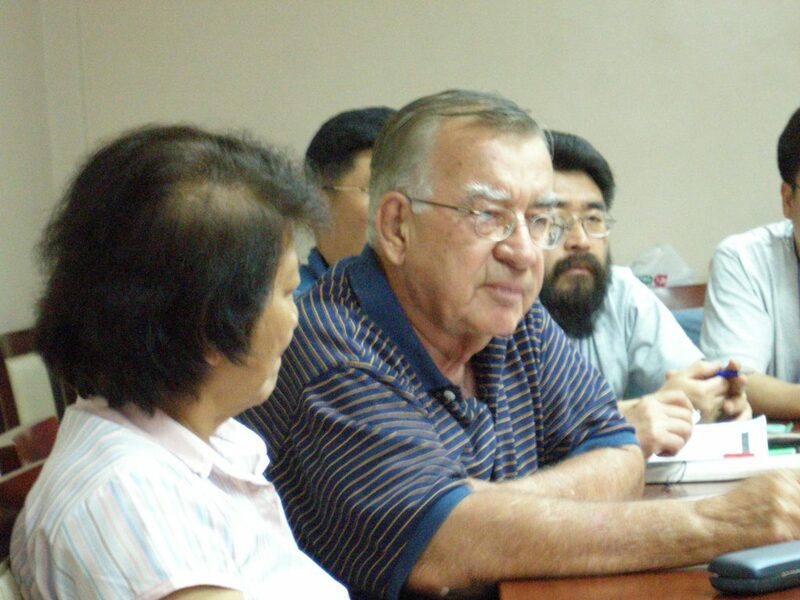 Denis was the father and founder of many initiatives in community organizing, certainly in the Philippines where he mainly lived and worked, but also in India and Asia where his work also inspired many organizing programs among the urban poor. He and his wife, Alice, also a community organizer, trained and inspired organizing in Kenya as well. Denis and Na had invited me to several meetings of Asian organizers in Manila in the LOCOA, a network of Local Organizers and Community Organizations of Asia. I had visited with him as well in New York City, where he would spent a month or so living in Manhattan near Union Square with his sister, who was a nun, just as Denis had been a priest. His organizing was old school, focused on building “peoples’ organizations” among the poorest and most powerless, so he saw many affinities with ACORN, though always scratched his head about dues, he invited me to the Philippines to tell the story and teach the model. His shadow is long over the work in Asia, and his passing will be missed, but also honored for its contributions. Denis Murphy cut his teeth organizing the urban poor in the late 1960s. It became his lifelong advocacy even after he left the priesthood. He even tried to convince Mother Teresa to get involved in it, his widow said. The founder of Urban Poor Associates died on Oct. 2 at 86, capping more than 40 years of community organizing in the Philippines and in other Asian and African countries. In death, many remembered Murphy for championing the rights of the poor—from slum dwellers in Tondo to fishermen in typhoon-ravaged Tacloban—and teaching them to have a voice of their own. Vice President Leni Robredo, former President Benigno S. Aquino III, Senators Bam Aquino and Rissa Hontiveros, and former Cabinet members Dinky Soliman, Florencio Abad, Teresita Deles and Carina David, among others, came to pay their respects. But it was the community organizers from around Metro Manila and elsewhere who packed Arlington Memorial Chapels in Quezon City where his ashes were to pay him tribute. “He had always accompanied us to dialogues. If an American was helping the poor, who were we not to help the poor?” community leader Bernadette Sabalza said in her eulogy. “There were days when I felt daunted by the odds. But I’m holding on to my promise to Sir Denis to fight for my members. I’ll fight for our cause till my last breath,” she said in Filipino. “Denis was passionate and committed, a true Irishman, but no less Filipino than most of us,” said Inquirer Opinion editor Rosario Garcellano. “In fighting for better conditions for the urban poor, he was in there pitching, even during the dangerous days of martial law. He was in Tacloban before he fell ill, helping the homeless get their bearings in more ways than one,” she said. And he was such an evocative writer, Garcellano added. “Whether describing the misery of a coal-packing community in Tondo with its sooty sad-eyed children or the windswept cemetery where his brother is buried, the leaves turning into the colors of fall, he brought the reader to the precise, chilling moment,” she said. Murphy first came to the Philippines with the Jesuits in the 1950s. After completing theology studies in Woodstock, Maryland, he returned in 1967 as a priest. From that time until 1976, he served as deputy director of the Institute of Social Order in Manila and was put in charge of urban social work across the country. It was here that he became involved in community organizing. From the ’70s onward, he helped kick-start community organizing by founding the Philippine Ecumenical Committee for Community Organization and Community Organization of the Philippines Enterprise. He even invited American Saul Alinsky, considered the father of modern community organizing, to Manila. Murphy left the priesthood in 1976 when he married Alice Gentolia. Community organizing became their shared advocacy. They have a daughter, Marifel. He also founded the Asian Committee for Peoples Organization, an ecumenical body that introduced community organizing to India, Hong Kong, Thailand and Indonesia, and offered training in Pakistan, Japan, Malaysia and Singapore. Murphy also helped set up a community organizing program in Nairobi, Kenya, with COPE sending a team to train young Kenyans in organizing on such issues as garbage collection, water, jobs creation and evictions. In his visits to Calcutta, India, he often called on Mother Teresa, according to Alice. “He would go around. Calcutta was one of his favorite cities and Mother Teresa was there. What he did was talk to her, trying to convince her to get involved in community organizing,” she recalled. In New York, Murphy joined the 1965 Freedom March in Selma, Alabama, led by civil rights leader Martin Luther King Jr., Alice said. Murphy was born in New York on Sept. 18, 1930, to parents who had migrated from Cork, South Ireland, and who were members of the Irish Republican Army. He studied at the Jesuit-run Regis School in New York. His brother Ned was also a former Jesuit priest and sister Margareth was a nun. Their brother Tim was a soldier who served in the Korean War. Murphy wrote a novel, “A Watch in the Night,” short stories and commentaries for the Inquirer. Respect well-earned and gratefully given! This entry was posted in ACORN International, International, Organizing and tagged Denis Murphy by Wade. Bookmark the permalink.